For those who like to follow news related to politics in Central and Eastern Europe, and especially Ukraine, the last months have been extremely interesting. Before the Vilnius summit in November, a lot has been written in the media about the potential agreement signing by Ukraine, but also about Moldova and the trade restrictions imposed by Russia (such as the restrictions on Ukrainian chocolates, Moldavian wine and Lithuanian cheese). Although no one was really able to predict what was going to happen during and after the Vilnius summit – the situation was basically changing every day – I think no one really predicted the massive demonstrations that started in Kiev. Since that moment, again a lot has been written, especially considering the daily changing situations and flood of developments there. Although I like to follow this news closely, I won’t write extensively about it as there are many other journalists and scholars who wrote excellent analyses in a way I anyway couldn’t write it. For example, take a look at the articles I shared on Twitter , subscribe to the excellent magazine New Eastern Europe (and check their website), or read the interesting blog analysing Ukrainian politics Odessablogger. Recently (end of Jan 2014) I travelled to Ukraine. My trip started in Lviv, where one clearly could sense the revolutionary spirit: many buildings in the city centre had Ukraine ánd EU flags hanging out the window, and in a similar way many expressed support for the so-called Euromaidan movement by decorating their cars with flags. Most (coffee)bars and restaurants where showing a livestream of the demonstrations in Kiev, and the violence that took place there. In the city centre, near the opera house, there was a small square with a stage and a tent of the Svoboda part that also showed a live stream during the day, and at night became more crowded with on-stage speeches. One day, when I passed the city hall on the main square in the city centre, a small group of citizens suddenly gathered and started singing and chanting while urging others to join them. One lady marched forward to the entrance, after which the group followed and forced their entry into the city hall. 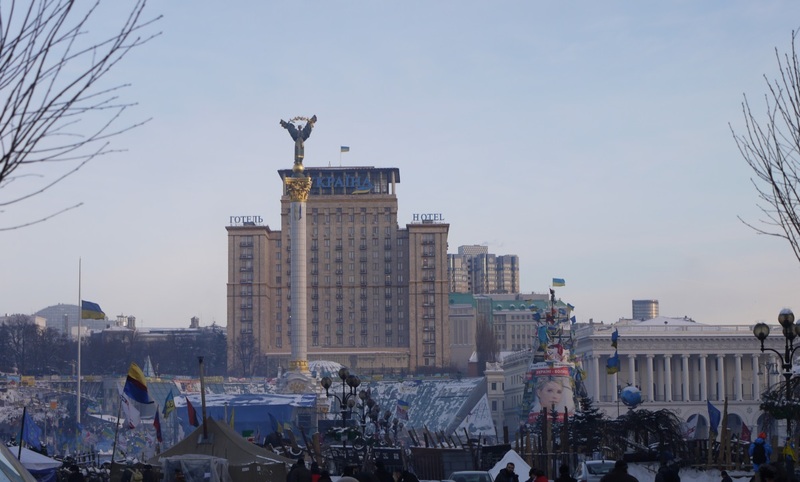 Although it was rather peaceful in the city, this sudden action reflected the mood of dissatisfaction – especially after the violence took place in Kiev a day earlier. 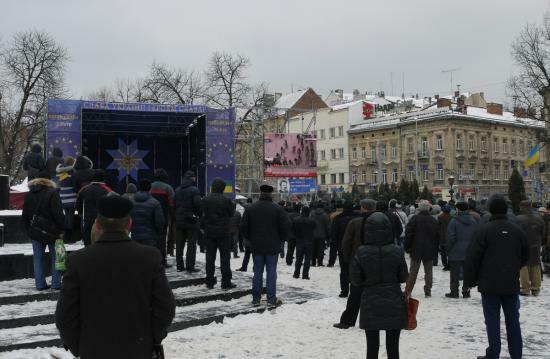 Later, when I left the city, I read that the regional administration that is also present in the Lviv was stormed and occupied by angry demonstrators. Soon afterwards, this also happened to many other regional governments in Western Ukraine. The mood in Odessa was completely different. No flags at all, and not a single sign of unrest or demonstrations, though I’ve heard of a small demonstration during one of the days when I was there. Odessa, especially because of its large port (and the ‘incomes’ and business that comes with that), is mainly pro-government and it was surprising to see these sharp contrasts. In Eastern Ukrainian cities the contrast is said to be even larger, though I didn’t go there. After a week of severe and violent clashes with the riot police , and grim pictures of the city because of burning tires and molotov cocktails, Kiev was in a more calm (though not stable) situation when I arrived. The protesters faced a different challenges: the cold arrived too, with temperatures as low as -20 during the day and -25 at night, with a strong and sharp wind in addition. Most parts of the city continued ‘business as usual’. Even the shopping mall under the maidan square continued to operate (! ), with the odd sight of tired protesters (equipped with helmets and such) warming up inside. The maidan area was fascinating to see. Perhaps opposed to what some would expect, it was not just a few jobless ‘anarchists’ that set up camp, but a small society within the city, consisting of many people with various backgrounds and from different ages. It was impressive to see how well it was organised: many points that supplied the protesters with tea and food, trash was being collected in a central place, gates were well guarded and even a blocked metro entrance had a little sign indicating which other entrances could be used. I wandered around a few times, observing what was going on. Though, I didn’t go that much further into the barricades to the street where the riot police was waiting. After all, anything could happen, and the guys passing you with helmets, balaclavas and bets made me feel a bit unease. So what’s next for Ukraine? It seems that the demonstrations won’t die out soon. What started as dissatisfaction with Yanukovich not signing the association agreement with the EU, grew into an opposition to the government in general and especially to the theft of the Yanukovich family. The police violence and the kidnapping of activists seem to only have fuelled the protests. But besides a president who wants to save his political position and business influence, Ukraine became part of a geopolitical tug of war between Russia and the EU. Russia is seeing Ukraine as ‘their’ territory, which might make sense from a historical perspective and considering the cultural proximity. It does everything in its power to keep Ukraine where it is now, by providing financial aid on one hand and threatening with economical barriers on the other hand. Furthermore, it provides the perspective of joining the Russian led Customs Union, a free trade area that now consists of Russia, Belarus and Kazakhstan. At the other side we have the EU, who would like closer (trade) relations with Ukraine. By holding on so firmly to the issue of Tymoshenko as breaking point and with economical advantages that are only foreseeable on the long term, it didn’t manage to get the agreements signed in Vilnius for now. The EU says the door remains open, but so far it didn’t manage to quickly adapt to the new reality and make its deal more attractive. This also raises the question, how much is Ukraine ‘worth’ for the EU, and what else should it offer? Should (trade) agreements remain a ‘carrot’ as incentive to reforms, or does the current situation demand a change in strategy considering the EU might loose Ukraine forever otherwise? These are one of many questions that arise when looking at the current situation. For now, the Euromaidan movement seems to maintain its momentum and in my opinion Klitschko emerged as a solid opposition leader (also judging by its performance at the Munich Security Conference last week). The country remains rather divided, however. The next weeks, months and years will determine the future of Ukraine, with not only political but also economical developments to come.